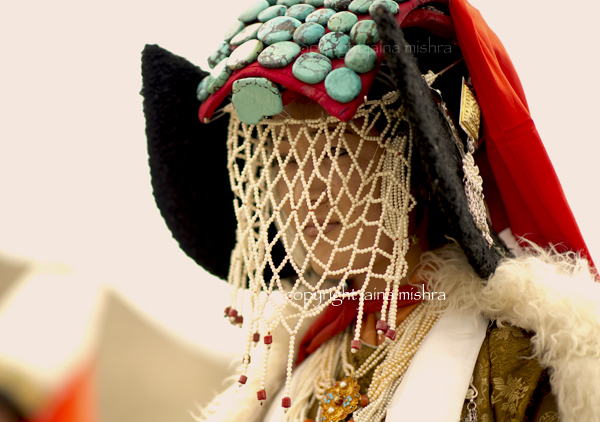 The magnificent head dress of Ladakh – the Perak laden with rows and rows of turquoise gem stones and coral, is probably among the most exquisite bridal ornaments in the world. It is also probably the heaviest symbol of marital status. 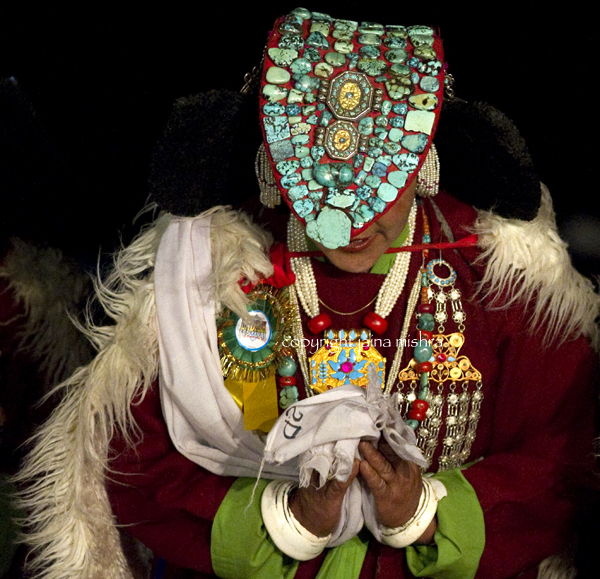 Heirloom head dresses weighing between 3 and 8 kg laden are handed down from mother to daughter and are signature expressions of identity of all the Buddhist ethnic groups of Ladakh. The Perak is worn in regions extending from Zanskaar valley, the the Nubra valley, the Changthang valley as well as the lower valleys of Spiti, and Kinnaur. On a recent trip to Ladakh, I had the good fortune of being exposed to 50+ not-for-sale heirloom Peraks. This lengthy exposure led to an appreciation of these pieces of art, and awakened my interest in this subject. As very little little literature is available on the subject I have taken it upon myself to research this category and present these results in the public domain. This study is ‘The Blue Veil Project’. Originally planned for 2012, this project was postponed due to a time crunch. It now appears to be feasible in Spring 2013 when I plan to devote my time, my energy and my financial resources to this study. I am also seeking support from readers, textile collectors and organisations. RAISON D’ETRE : The current generation of mothers and grandmothers are probably the last custodians of in-depth cultural knowledge about Ladakh’s costume traditions. Traditions are slowly fading and with the passing on of the elders, the cultural knowledge held collectively by this aging group will be lost to the world. My interest lies in collecting data about Ladakhi Peraks and preserving the information in a format that will outlive the last custodians of this knowledge and making it available to the world for posterity. SCOPE OF COVERAGE : Peraks will be studied across all the valleys of Ladakh – Zanskaar, Nubra, Changthang and the bordering areas of Spiti, Lahaul and Kinnaur. The study will research the differences in the Peraks across regions, the significance of each element of the Perak, the religious and cultural contexts of each element and the evolutionary influences that led to the nuances of the differences between Peraks. The study will also result in an image library of surviving heirloom Peraks. METHODOLOGY : Relying on the support of my network of reliable Ladakhis – drivers, guides and individuals who understand their own culture deeply – I plan to travel through the 5-6 valleys into the homes of Ladakhis to study and understand their family owned heirlooms. The structures interviews will be recorded on paper or video (depending on permissions granted by the families). The heirloom pieces will be photographed professionally. TIME FRAME: Fieldwork will take about 45 days in 2012 split over 2 – 3 trips. Travel in this region is solely by Himalayan roads and travel time is expected to comprise 40% of the total fieldwork time. Pre and post desk work will take 60 days to prepare for the project, collate the data and putting it together into a presentable form. FUNDING SUPPORT: The estimated project cost is USD 15,000. This is a non-commercial project and I do not expect to recover any of the money I put into this project and therefore I am appealing to readers to make a contribution to fund this project partially. This will ease the burden on my personal budget. Detailed cost estimates, date plans and Audited final cost sheets will be made available to donors. If you own a Perak, please send in images and information for inclusion in the study. Help in arranging the publishing of this material, in the form of a coffee table book will be highly appreciated. If you have a website / blog / forum and would like to support The Blue Veil Project please link this page to your pages. Publicity in any medium including word-of-mouth would be highly appreciated. CONTACT : I can be reached at jaina@wovensouls.com and will be happy to answer any questions and discuss details. 5. A recent bride who demonstrated the complicated wearing of the headdress. We will now enter stage 3 of the project in collating the knowledge. The project has been partially culminated in a feature published in Hali – Spring 2014 Issue. The balance subject matter will be eventually published as a coffee-table book (if a publisher is found) or an e-book. Love all the pieces in your gallery. My fav are the pieces from Rajasthan. Could you please tell me where I can buy those in BLR? Thanks in advance!!! This entry was posted on October 1, 2011 by wovensouls in Art Kaleidoscope and tagged antique, art, Arts, Asia, blue, bridal, Buddhism, Changtang, costume, cultural, culture, Donation, dress, ethnic, ethnic minority, evil, Folk, folk art, headdress, himalayas, india, jaina mishra, ladakh, Ladakhi, Leh, lifestyle, Nubra, Nubra Valley, Perak, poject, project, protection, research, study, The Blue Veil, the blue veil project, tibet, tradition, turquoise, turquoise headdress, vanishing culture, veil, wovensouls.